In a room on the second floor of Anchorage School District headquarters Saturday, clothing racks were brimming with hundreds of dresses, high heels crowded a table and more than two dozen bottles of nail polish stood in a line. There were shawls, necklaces and bracelets, too. It's prom season and here, at the local chapter of Becca's Closet, everything is free. 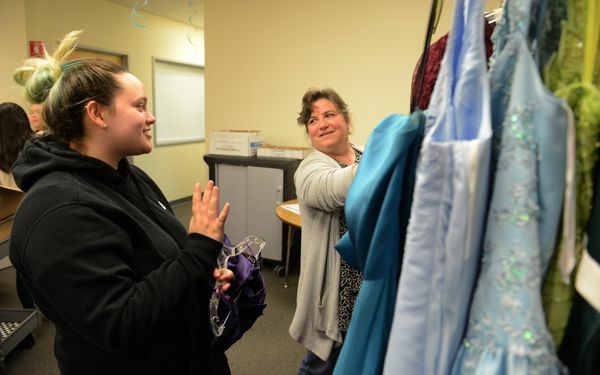 "Dresses are so expensive," said Katy Grant, a district employee whose daughter, Anna, started the prom dress giveaway in the city about six years ago. "I had one mom tell me she had to pick up a second job last year just to pay for her kids' dresses." Becca's Closet is a national nonprofit that started in Florida more than a decade ago to honor a teenager, Rebecca Kirtman, who died in a car crash in 2003. 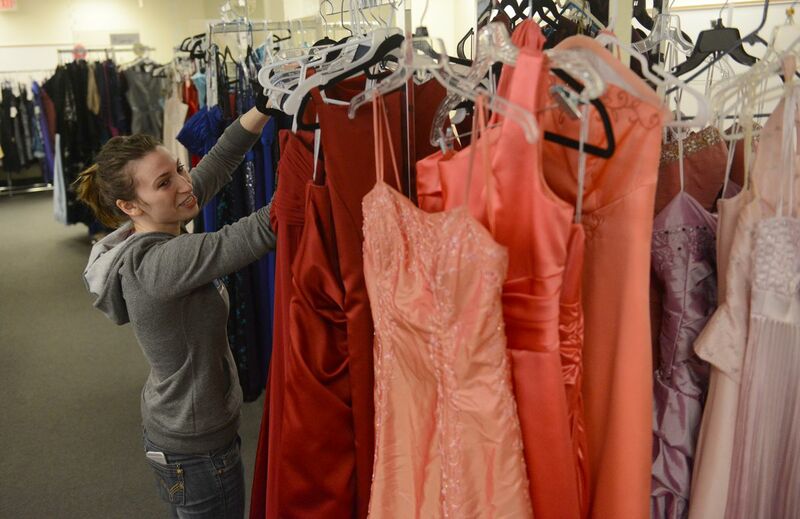 Before her death, Kirtman had collected prom dresses for those in need. Anna Grant heard about Becca's Closet in high school. As a senior at East High, she launched the Anchorage chapter of the nonprofit for a Girl Scouts project. Now, Grant is 24 and the project continues. It's like a pop-up shop, but without any financial transactions. It opens in Anchorage for about a month every spring and has attracted people from all over Alaska. "It's definitely grown a lot," Katy Grant said. On Saturday, Katy and Anna Grant helped teenage shoppers sort through the racks of dresses. Some teens came with friends, some with prom dates and some with their moms. They had a lot to choose from — short dresses, long dresses, sequins, lace, rhinestones, velvet and silk. All of the dresses were donated, many of them worn just once before at a dance and a few still had price tags on them. Emalee Kramer, 17, said she read about the free prom dresses on Facebook. She's going to prom at East High in May. She went shopping for dresses, but couldn't afford them. Many of them cost hundreds of dollars, she said. The one she really liked cost nearly $400. "I just don't have the money," Kramer said. After trying on a stack of items Saturday, she picked a floor-length navy blue dress. That's her favorite color, she said, smiling. It cost her nothing. As Kramer looked for shoes, Jessicca Andreanoff held up dresses while talking to her sister, Alberta, on a FaceTime video call. She said her sister lives in Akiachak, a Southwest Alaska village of about 700 people, and needs a dress for graduation. Alberta had read online about free dresses in Anchorage, and asked her older sister to stop by the shop. Katy Grant said the dresses are for any Alaska teens who need them. Over the years, the Grants said, they have received many hugs from happy students and happy parents. Some cry. Some just spend time waltzing around the makeshift shop and twirling in their new dresses. "They're get so excited and just feel so pretty," Anna Grant said. So far, about 150 people have gone home with a free dress this year, the Grants said. In the past, hundreds more. 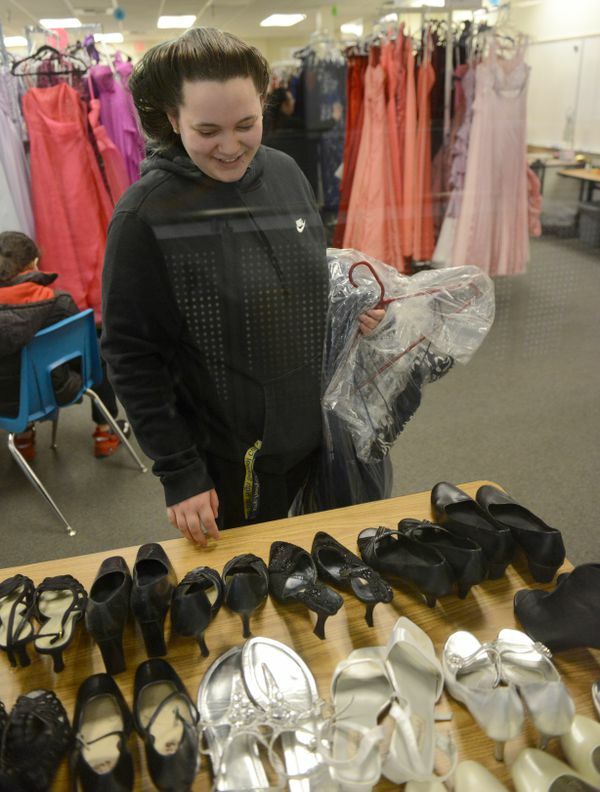 Next Saturday, April 28, they'll hold their final dress event for the season from 11 a.m. to 3 p.m. at Anchorage School District headquarters, 5530 E. Northern Lights Blvd. Students can also arrange individual appointments, Katy Grant said. Those looking to donate dresses and accessories can drop the items off at the district building on Monday through Friday, from 8 a.m. to 5 p.m., or on Saturday.